The reboot based on the character originally created by Robert E. Howard is coming to high-definition this November. In an early announcement to retailers, Lionsgate says 'Conan the Barbarian' and 'Conan the Barbarian - 3D' (Blu-ray 3D/Blu-ray/DVD/Digital Copy) are coming on November 22. 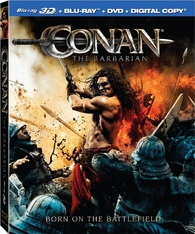 In an epic battle led by an epic hero, Jason Momoa (HBO's "Game of Thrones") stars as Conan, the Cimmerian set on avenging his father's death. The action-packed film, directed by Marcus Nispel ('Friday the 13th'), also stars Rachel Nichols ('Star Trek'), Stephen Lang ('Avatar'), Rose McGowan ('Planet Terror') and Ron Perlman ('Hellboy'). Specs have yet to be detailed, but supplements include two audio commentaries, a history of the Conan franchise featurette, "The Man Who Would Be Conan: Robert E. Howard" featurette that looks at the creator of the famous character plus two additional featurettes that examine the action and fight scenes. Suggested list price for the Blu-ray is $37.99 while the Blu-ray 3D combo is only a few dollars more at $39.99. You can find the latest specs for 'Conan the Barbarian (2011)' linked from our Blu-ray Release Schedule, where it is indexed under November 22.